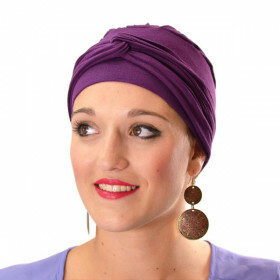 Very practical turban comprising an ultra soft jersey cap with separate headband. The advantage of this turban is that it enables the cap to stay in place on the head, offers lovely volume and will be perfect for covering up very short regrowth hair! You have the right to dislike a product, to make a mistake or to simply change your mind... We completely understand that a turban may not suit you and we are devoted to giving you satisfaction and helping you find the right product to ease your discomfort and meet your needs. Do not worry if you are not entirely satisfied with one of our products! If you are not totally satisfied with you purchase, you can return it to us within 10 days after reception. - that the return parcel contains the order invoice so we can find the product references. Items which are returned incomplete, damaged, marked, or soiled by the customer will not be accepted. Make sure to include the invoice in your return parcel and indicate you either require a refund, an exchange or a credit note. Do not forget to state the reason of your return so we can improve the quality of our catalogue! Please, do not that the parcel must be sent by recorded delivery and signed for as proof of receipt. Keep your proof of posting at all times, it is your guarantee! In accordance with our terms and conditions of sale, the items returned will be refunded or exchanged but the customer must pay the return postage costs. Refunds will be made 30 days maximum after the return of your parcel. We are committed to dealing with your return in the fastest time possible.